The NDX is looking a bit different than the SPX. 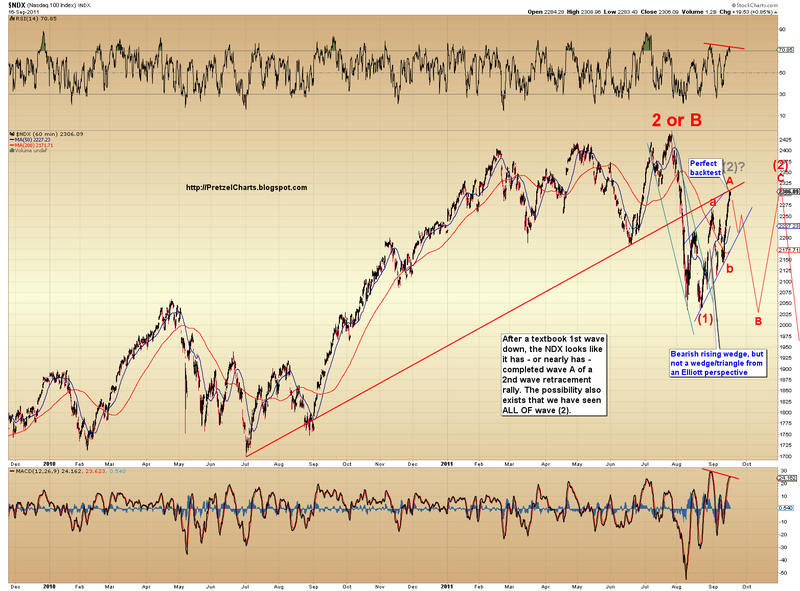 The NDX appears to have already completed a textbook-perfect first wave down. It is possible that the NDX has also finished, or is close to finishing, its second wave retracement... however, there is a need to reconcile the NDX count with the SPX count. This leads me to believe that the NDX will form a more complex second wave, likely a larger A-B-C expanded flat. Note the current perfect back-kiss of the old rising trendline. An interesting side note: you can see the bearish rising wedge formed on the NDX, yet this formation would not be considered a wedge or triangle from an Elliott perspective. This is due to the fact that it does not count well as its own wave, especially relative to the preceding action; it is instead the end of wave (1) and (wave A of?) wave (2) combining to form what traditional TA would classify as a bearish wedge. If my speculative A-B-C count is correct, wave (3) may be delayed for a time... although the chance exists that it is just around the corner. Either scenario bodes poorly for NDX bulls; wave (3) should ultimately take us to, and likely below, the July '10 lows. We'll look to the price action to alert us to the more concrete potentials as the move develops, and I will periodically update this chart to keep you posted.